THE race-hate Celtic fan who made monkey gestures at El Hadji Diouf bawled foul-mouthed abuse at photographers outside court this week. Shamed Sean Smith, 19, snarled "'shove that camera up your a***" at one snapper as he left Glasgow Sheriff Court after admitting racially abusing Rangers star Diouf. Smith handed himself in to cops after the News of the World published a shocking picture of him taunting the Senegalese striker at an Old Firm match. After being shown our photo on Thursday, Sheriff Celia Sanderson said: "This is far more eloquent than anything the Crown can say." Smith, from Rutherglen, near Glasgow, will be sentenced next month, but he has already been banned from watching any UK club play at home or abroad and he must sign in at a local police station during the first half of every Celtic game. 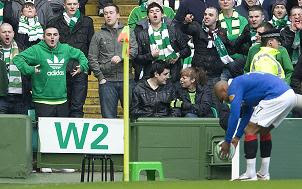 The court was told how Smith sprinted from his seat to mock Diouf just five minutes into the February 20 match. Prosecutor Claire Connaghan said: "As he approached the stand to take the corner kick, the accused approached the front of the stand where he commenced making ape-like physical gestures. "Witnesses were offended by what they saw as a racial gesture and the matter was reported." After the creep's bawling match outside court, an onlooker said: "He doesn't appear to have learned his lesson. He clearly needs to do some growing up."